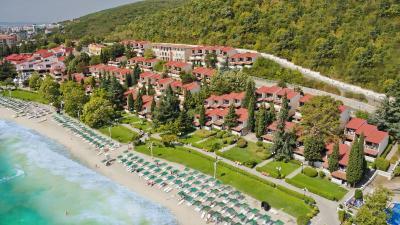 Featuring an outdoor swimming pool and a lobby bar, Villas Elenite - All Inclusive is located in the south-facing Elenite Holiday Village resort. It offers air-conditioned rooms with satellite TV. 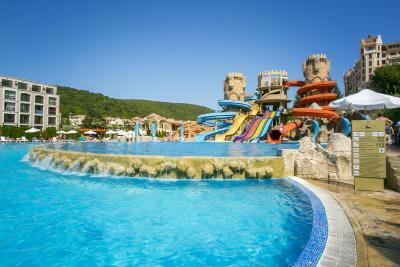 Guests also enjoy free access to Aqua Park Atlantida. Free WiFi is available in the hotel lobby. Guests benefit from 3 thematic À la carte restaurants on the territory of the complex an Italian, a Bulgarian and a restaurant with Mediterranean cuisine. Villas Elenite - All Inclusive has a team of professional animators. Guests can play darts, air gun, beach volleyball, aerobics, water gymnastics, water polo and more. Medical service is provided 24 hours a day. The Aqua Park is 650 feet away, the bus stop is 1,000 feet away and Sunny Beach is 3.7 mi away. The Old Town of Nessebar is 6.2 mi from the property. When would you like to stay at Villas Elenite - All Inclusive? This room features a balcony, air conditioning and TV. Private parking is available at a location nearby (reservation is not possible) and costs BGN 12.01 per day. Air-conditioned, room with attached bathroom with balcony and direct sea view. A TV is also provided. This double room has a balcony, private entrance and cable TV. Air conditioning comes standard. This air-conditioned room has a balcony, seating area and private entrance. A TV is also included. This air-conditioned room features a balcony, sofa and cable TV. This double room has a balcony, air conditioning and seating area. A TV is also included. This air-conditioned room features a balcony, seating area and sofa. A TV is also included. House Rules Villas Elenite - All Inclusive takes special requests – add in the next step! Please note that the water park will be available from 01/06/2018 until 15/09/2018. We need at least 5 reviews before we can calculate a review score. If you book and review your stay, you can help Villas Elenite - All Inclusive meet this goal.